There is a new way to break through your smoking habit. This is a “As Seen On TV” product. This is all natural and contains absolutely NO nicotine! This whole kit comes with a soft squeeze ball for stress, a band for your wrist that is used to pop when you need to take your mind off of smoking and the craving. The headphones should come with a warning that tells you that if you relax to much from the sounds that you’ll pass out in a deep sleep and not hear anything at all, even if you do have sleeping issues. These headphones work great, sometimes to great. They do relax a person enough to where after the cycle ends and automatically shut off, you’ll be so relaxed you’re ready to grab a blanket and snooze for a while. These could also be used to treat depression and insomnia! 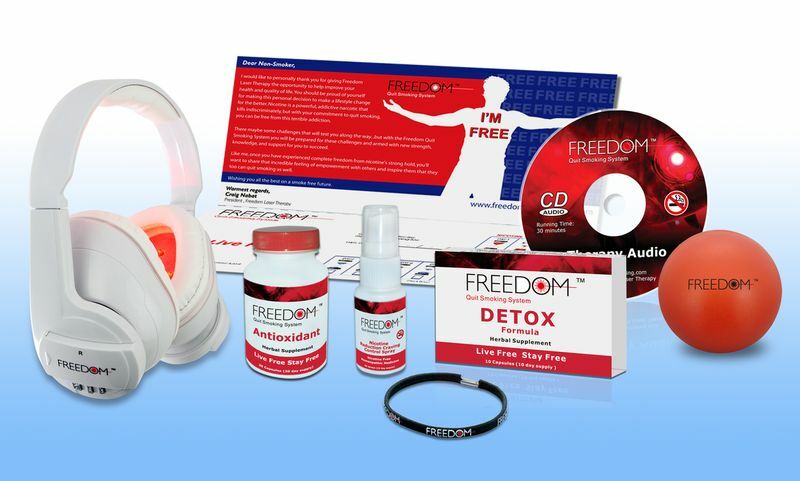 There is a CD included in the kit for your own listening as a coach to the kit and quitting. The small spray is a spray that goes up under the tongue with 2 sprays for 3x a day. It actually does kill the craving, no nicotine included. The herbal pills are taken 3x a day to help rid your body of the toxins from smoking that build or have built up in your system, making you not crave cigarettes at all. I highly recommend this for all of those smokers out there that want to quit and have tried to quit! It works wonderfully!